Cuba is a natural wonder. VIRGIN CUBA refers to those pristine areas of Cuba, including caves and marine habitats, which are natural and unspoiled. These areas of Cuba must be further protected into the New Millenium and "kept green". Cuba has been referred to as the "Isle of a Hundred Harbors". Mountains and hills comprise about one-half of the land in Cuba. Mahogany, cedar, ebony, logwood and rosewood are some of the indigenous trees in Cuba. Palms, including the royal palm and the coconut palm, evoke images of distant, tropical paradise. Brightly colored flowers, including flowering of orchids and cacti, especially in the areas near Soroa and Cienfuegos, respectively, are dazzling. Animals in Cuba include deer, wild pigs, parrots, bee hummingbirds, butterflies, bats, snails, frogs, iguanas, quail, snipe, turkey grouse, crocodiles, alligators, and thousands of species of sea life. Mountain ranges with fertile valleys all fringed by long stretches of sandy beaches, ironshore, mangrove swamps, marsh lands, lagoonal ponds, and coral reefs validate the initial thoughts and writings of Columbus when he discovered Cuba in October, 1492. The rich soil of Cuba allows agricultural produce (sugarcane, coffee, cacao,citrus, tobacco, etc.) to a major component of Cuba's GNP. VIRGIN CUBA© is a publication dedicated to revealing to the global community the natural wonders of Cuba. The "wildness of Cuba" can best be explored by hiking, horseback riding, canoeing, or biking through areas not accessible by today's vehicles. 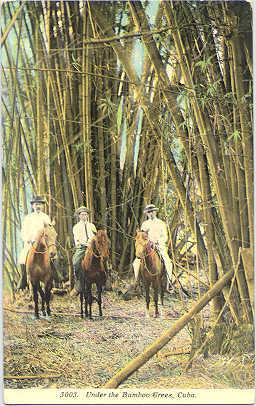 Hints and tips from readers who have personally explored Cuba are always appreciated and will be included in future issues of this publication. Look for our future website: www.virgincuba.com for an expanded eco-sensitive cyber-resource about Cuba, its natural wonders and the ways for you to discover and explore them. © Copyright, 1999-2009 Havana Bay Company, Inc.All rights reserved.